A 4-panel screen in landscape format covered with useful information on the DM's side. The Elder Elemental Eye rises in this adventure book for characters from 1 to 15th level. 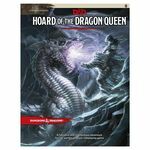 Stop the rampage of demons through the Underdark in this adventure book for characters from 1 to 15th level.